Children's Stories - Are We On the Moon? "There aren’t many trees on this island, are there?" Bonnie asked, looking at the barren landscape below. "It seems to just be a lot of peaty bogs and marshes, or a lot of stones and mountains." "Harris doesn’t have many trees, Bonnie," Bruce, the butterfly answered, "but they do have beautiful white sand beaches. Harris is known to be one of the most beautiful places in all of Scotland. There is a lot of machair." "What is machair?" Bonnie enquired. "Machair? It’s a type of sandy coastal grassland. The wind blows the sand inland and grasses grow from it. You mentioned yourself that you thought it looked like marsh and bogs." "Oh. I’d never heard that word before. I suppose the people who live on Harris speak Gaelic too?" Bonnie questioned. "That’s right. The Gaelic word for Harris is ‘Na Hearadh’. It comes from a Viking word meaning High Island," Bruce explained. "How do you know all this stuff? Everywhere we go, you know all there is to know about the place. It’s amazing," Bonnie said in awe. "I listen to thing the other butterflies talk about," Bruce smiled. "Whoa!" Bonnie shouted. "Look down there! It looks like we’re on the moon." Below them lay a vast area of black and dark brown stones. There was no vegetation growing, just stones, large and small. "It does rather look like the moon," Bruce agreed. "Would you like to go and visit the moon?" he snickered. "Why not! My wings are rather tired. I could use a rest, but I’m sure there are no flowers anywhere around this area," Bonnie sighed. "I don’t think so. We’ll have to go into the town, Tarbert, to find flowers. We’ll do that later on. Come on, let’s go to the moon," Bruce said. 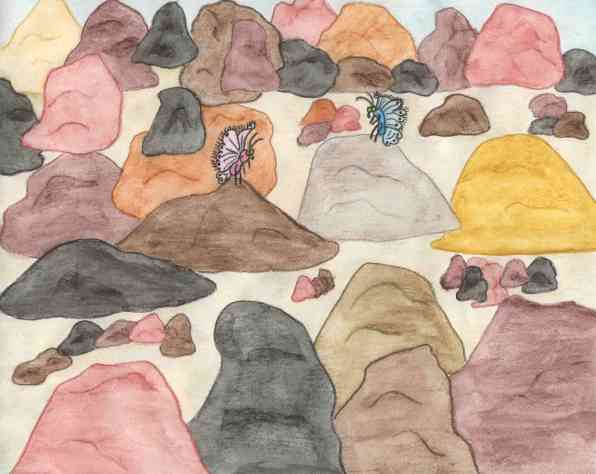 The butterflies fluttered down to the dark stones. "I see an eagle," Bonnie said, pointing at the mountains. "It’s far away though, probably searching for a mouse." They watched as it soared around the mountains. "Those look like giants, don’t they?" she said, pointing at the rocky hills. "They look cold and dismal though. I don’t think Harris gets much sunshine." "This is brilliant. I feel like we’re on the moon. It must be just like this up there," Bruce said, pointing at the pale moon. "Except, there wouldn’t be any blue sky or clouds, or the sound of the sea rushing in, or the sweet smell of the peat bogs." "You’re right about that. Speaking of sweet smells, let’s head to town. I am hungry for a delicious flower," Bonnie said. They flew towards Tarbert. "There’s not much on this island. It’s basically just a quiet place where one can go to get away from it all. I see an old church down there. If I remember correctly, it’s called St. Clements Church. Aside from that and an old castle, Ardvourlie Castle, there aren’t too many more things on this island. There are a lot of ancient stones and mounds and things but that’s it." "What about animals?" Bonnie asked. "I spotted some seals and otters. We saw an eagle and I think they have deer here," Bruce answered. "There’s the town, though it’s more like a village. It’s rather small, isn’t it?" Bonnie mentioned. "I think in town we’ll see a few shops. I know that Harris is famous for its Harris Tweed. There are weavers who make it and the tweed is used for jackets and coats and other things," Bruce said. "It’s cold here. I imagine they need to wear warm coats," Bonnie replied. "Aha. I see flowers. Finally. I’m starving." "You’re always hungry, Bonnie. Let’s get something to eat and then be on our way. I’ve a feeling a storm is approaching. They say that Tarbert gets rain during two thirds of the year and I think one of those rainy days will be today." The butterflies sipped their nectar from some small wildflowers and then fluttered off before the rain came down. "I liked visiting the moon," Bonnie giggled as Harris vanished behind them.